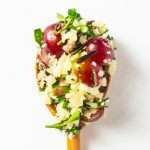 Bright and pretty, this recipe combines low carb cauliflower rice with a wild rice to give the perfect balance between low carb and great texture. Rinse the wild rice. Bring stock and salt to a boil, stir in wild rice and cover. Turn heat to low and cook 45 minutes or until done. Drain any excess liquid. While the rice is cooking, prep your other vegetables. Melt ghee in large saute pan over medium heat. Add onion, cook 5-7 minutes until soft. Add cauliflower rice, cook until just tender. Add wild rice and grapes, heat until the grapes are warmed. Stir in parsley and salt & pepper to taste. If you rice your own cauliflower you can also grate the onion.